Bigge Crane and Rigging Co.’s LTM 1400-7.1 crane setting cooling towers atop a commercial building in downtown San Jose, Calif.
Bigge Crane and Rigging Co., one of America's premier global crane sales and rental companies, expanded its "perfect fleet" of cranes with the Liebherr LTM 1400-7.1all-terrain crane. The LTM 1400 all-terrain crane can serve many industries including petrochemical, precast girder, tower crane erection and dismantling, and high reach commercial work. This 7-axle mobile crane is one of the most compact of its class and extraordinarily maneuverable due to its active rear-axle steering, according to the manufacturer. The ballast radius can be significantly reduced for use in constricted areas by moving the counterweight. 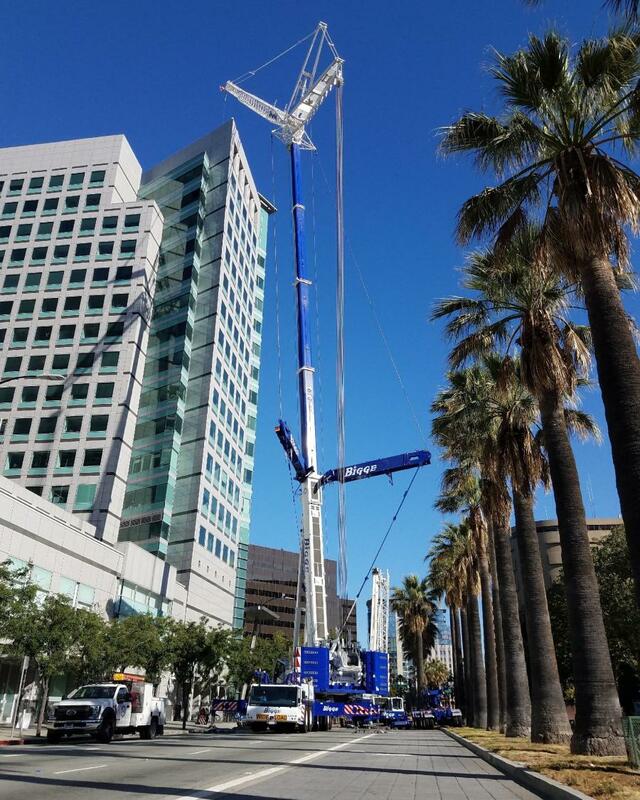 Headquartered in the San Francisco Bay Area in San Leandro, Calif., Bigge Crane and Rigging Co. operates a strategic network of 15 service locations nationwide that provide logistical and field support throughout the United States. The company is well versed in Liebherr cranes and the quality of service that comes with the product. The company operates 90 Liebherr cranes for work in various applications. With the recent purchase of the LTM 1400-7.1, the company has plans to use it for projects pertaining to HVAC, bridge girder, industrial and refinery work. "We purchased the LTM 1400-7.1 because we are building the ‘Perfect Fleet' of cranes, and the LTM 1400-7.1 is the best 500 ton class crane available today," said Joseph Nelms, vice president. "Liebherr quality and our pursuit of the perfect fleet via best-in-class philosophy, we buy what we think are the best cranes in each category of cranes." One of Bigge Crane and Rigging Co.'s recent projects was setting cooling towers atop Adobe Systems in San Jose. The project called for a midnight rig-in and a 6 a.m. hook ready time. In order to complete the project, it required a myriad of planning and coordination efforts by the project management team, outstanding execution by the entire team in the field, and the powerful lifting capacity of the LTM1400-7.1. The 500 ton capacity crane was configured with 184 ft. of boom, 161 ft. of luffing jib, 220,000 lbs. of counterweight and Y-Guy (winged boom support system). Working for a mechanical contractor, Bigge Crane and Rigging Co. set 15,000 lbs. cooling towers atop the Adobe Systems building, lifting them over 255 ft. high at a 135 ft. radius. Bigge Crane and Rigging Co. also recently purchased the last LTM 1220 cranes ever to be produced. They operate about 12 of the LTM 1220 cranes in their fleet along with other cranes from Liebherr Werk Ehingen and Liebherr Werk Nenzing factories. The company also helped pioneer the LR 1300 crane in North America and have developed the largest fleet in the US. In addition to this, it also is building a telescopic crawler crane fleet from Liebherr, starting with the LTR 1100 and LTR 1220. Since 1916, Bigge has served the commercial, government, and industrial markets. The company has acquired machines that have been operating for as long as 20 years. With more than 1,300 rental assets in its fleet, it provides crawler, tower, rough terrain, truck, all-terrain, and carry deck cranes from all the leading manufacturers. For more information about Liebherr, visit www.liebherr.com.